HostSolutions Review 2019: Is HostSolutions a Good Hosting? For not only exceptionally affordable prices but also a decent variety of hosting solutions, HostSolutions is a viable choice for those looking for hosting in Southeastern Europe. They operate their own data center in Oradea, Romania, and feature a “no overselling” policy on their servers. HostSolutions has been in the industry as far back as 1996. Since that time, they’ve managed to put together an affordable offering with global infrastructure, cloud computing capabilities, and specialist expertise. They own and operate their own data center in Oradea, Romania, which is fully manned by certified technicians. Note that HostSolutions doesn’t offer domain registration services, so you’ll need to already have a domain before purchasing one of their packages. Considering their prices, I don’t blame HostSolutions for providing relatively simple hosting packages. What’s impressive though is that even their cheapest shared hosting plans come with SSD storage and some of the pricier options are RAID 10 redundant. They also allow unlimited domains, subdomains, email accounts, FTP accounts, and MySQL databases with nearly all their products. Resellers get a cPanel/WHM license, which is one of the best management panels for resellers. 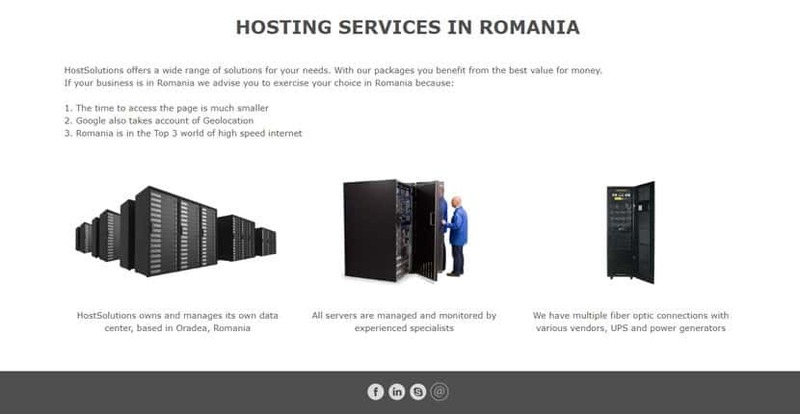 It’s also clear that especially as a VPS or dedicated server customer, you’ll enjoy the benefits of their above-average Romanian data center. Once again, you’ll have fast disks with HDD or SSD storage as well as RAID 10 redundancy and a “no overselling” policy on their servers. You’ll also have great network speeds with 1 Gbps port speeds, and they feature 4-96GB ECC RAM. Dedicated servers run on Intel Xeon CPUs and provide full root access with fast activation times of two hours. HostSolutions has shared hosting plans on offer to suit any budget. There are nine plans spread across the Personal, Starter, and PRO categories. The pricing for these plans is incredibly low, especially considering the relatively decent storage and the high bandwidth allocations. The cheaper plans only offer annual, biennial, and triennial billing while the more expensive plans offer monthly and quarterly options too. Note that only their shared hosting plans have a 14-day money back guarantee. There are even more choices available when you look at their VPS plans, with nine plans for every type. The cheapest plan again only has longer-term billing. With the exception of their Storage and SSD VPS, all VPS plans feature unmetered bandwidth and the prices are again very affordable. There are 18 dedicated server configurations available for budget, professional, or high storage needs. Although the prices can get pretty high, they are still on the cheaper side compared to market averages. Unfortunately, none of their prices include SSL certificates or domains. HostSolutions provides free 24/7 technical support with all of their products. They also provide multiple channels to contact them including via phone, email/tickets, and live chat (although this appears to only be online during their working hours). Their support staff are friendly and helpful and you usually don’t have to wait too long for a reply. It’s just unfortunate that their knowledge base is empty, which means you’ll be dependent on their support or your own problem-solving abilities. With their incredibly low prices, almost anyone would be tempted to join HostSolutions, even if it means you’ll have to do some work setting up your hosting solution exactly as you like it. Their wide range of prices for all types of hosting cater to any budget. Wondering how HostSolutions stacks up against other Web Hosting companies? Enter any other Web Hosting company and we will give you a side-by-side comparison.